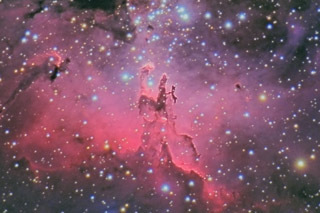 M16, the Eagle Nebula, contains a beautiful emission nebula and an open star cluster. At the heart of the nebula is the famous Pillars of Creation, the subject of one of the Hubble Space Telescope's most famous images. The star cluster embedded within M16 is NGC 6611, while the nebula is IC 4703. Software Used Images Plus 4.5 for camera control, calibration, stacking, digital development, Lucy-Richardson deconvolution, multiresolution sharpening, smoothing and noise reduction. Photoshop CS5 used for levels and curves, color correction, high pass filter, star shrinking, saturation adjustments, lab color, sharpening, screen mask invert, and noise reduction. Gradient Xterminator for gradient removal. Carboni Tools for additional saturation adjustments, noise reduction, and smoothing. HLVG for additional color correction. Notes With this image, I had the challenge of trying to capture an extended field that utilized my telescope's entire field of view. However, my telescope's focus is not flat over the entire field. As such, if I focused for the center of the field, the edges would be very out of focus. Conversely, if I focused for the edges of the field, the center would be very soft. Because the center of the field has the extremely detailed Pillars of Creation, I did not want to compromise the sharpness of the center, nor did I want to sacrifice a wide field. Consequently, I developed a technique for creating this image. I took two separate sets of images - one set was focused for the very center, the other for the edges. Then, I blended the two images in Photoshop to use the best focus for each region. The only regret I have is that I should have exposed the outer regions more, as these areas contain the faint nebulosity. Nonetheless, I'm quite happy with the final result. 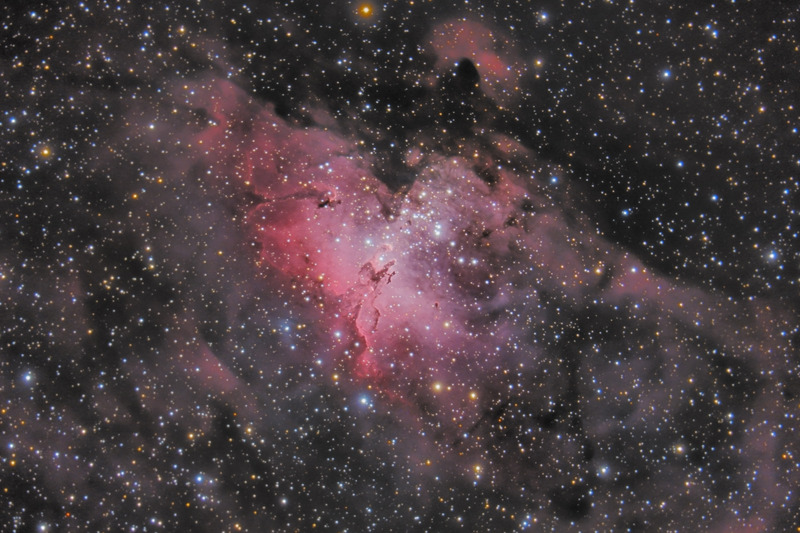 Astronomy Magazine honored this image by choosing it for their Picture of the Day for April 24, 2013!